One of my favorite books on China portrays Chinese history in the past 120 years through the experiences of a remarkable family. The book, China Mission: A Personal History from the Last Imperial Dynasty to the People's Republic (Louisiana State Univ. Press, 2013) begins and primarily focuses on the life and work of Reverend Halvor Ronning (1862-1950), a Norwegian immigrant to the United States who was inspired to become a missionary in the interior of China. He had been born to poor parents in Telemark, Norway, but upon learning that he could get pastoral training in Minnesota, he came to the United States at age 21 to study theology for four years (1883-1887) at the Hauge Synod seminary at Redwing, Minnesota and become a minister. In 1891, the tall, athletic Norseman, his sister Thea, and fellow missionary Hannah Rorem boldly enter a land of sorrow and tragedy coupled with charm and wonder, where their work of service, faith, and love is sorely needed. They found a Lutheran mission and school in Hubei province and put their lives at risk in many ways to serve God and bless China. They also found romance, and Hannah and Halvor soon marry and become the parents of a large family, in addition to caring for orphans and teaching and rescuing many other children. 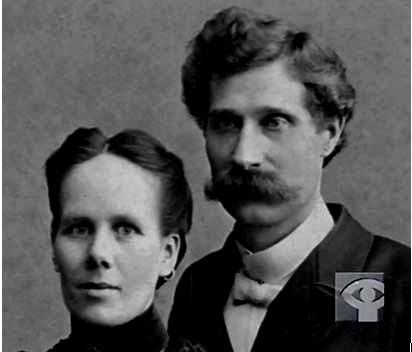 Halvor and Hannah Ronning, family photograph. Source: "China Mission: The Chester Ronning Story," a 1980 film by Tom Radford for the National Film Board of Canada (www.nfb.ca). These were great missionaries who loved and respected China. They learned Chinese, studied Chinese culture, and adopted many Chinese customs and dress. Some missionaries viewed them as heretics for not suppressing all traces of ancient Chinese practices among their converts and not viewing their Teutonic practices as inherently superior. But the Ronnings felt that native practices should be tolerated as long as they do not interfere with one's ability to worship God. 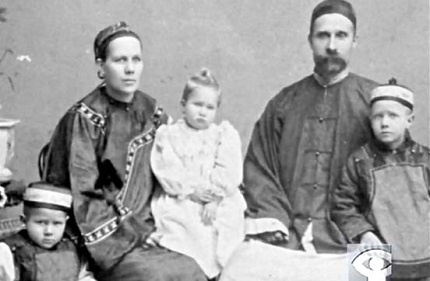 The Ronning family in Chinese attire. Source: "China Mission: The Chester Ronning Story." The story of their lives and the lives of their descendants reveals much about China and the role it now plays in the world. Many will benefit from the account of the Ronning clan, though toward the end of the book when the rise of Mao is described, some may be bothered by the author's biases, which result in a not-very nuanced account with Communists being described as refined saints while the Nationalists are nothing but villains. But regardless of where you stand on such matters, the personal experiences of the Ronnings around the turn of the century present a gritty, granular, and touching portrayal of a life of faith in China during some of its most pivotal moments. The book has much to say on the cause of Christianity in China. For now, though, I wish to focus on the remarkable example of Halvor Ronning in his life of faith, seeking to love the people of China even when they made life difficult for him. An account that especially touched and surprised me happened as he and his family had to flee China during the Boxer rebellion that began in 1898. The Boxers were a secret society, or a coalition of many secret societies that had spread across China. A key theme of the Boxers was blaming the ills of China on foreigners. They were certainly right in some ways. The great evil of opium and the many concessions forced upon China by the British and other nations were outrages. Unfortunately, the Boxers were not interested in distinguishing between helpful and vile foreign elements. Their approach ultimately became rather one-dimensional: "Kill the foreign devils." The source of so much of China's troubles, the Empress Dowager, a concubine of the former emperor who through murder, conspiracy, and brutality had seized power of China, exploited the Boxers to maintain power and echoed the Boxers' call with an official government decree: "Kill the foreign devils." It was an extermination order, China style. Many foreigners would be killed. The Lutheran missionary and his family had to flee their home and mission in Fancheng, China. Friends apparently bribed members of a related secret society, the Red Spears, who brought a boat to bring the family down the river on the way to Hankou, from whence they would reach Shanghai and then return to Norway and then the U.S., before coming back to China when it seemed safe again. Before the captain could pull up the gangplank and cast off, a gang of Boxers came running toward the junk shouting, "Kill the long hairy ones." The captain tried to stop them, but they shouted, "Kill him too. He is a secondary hairy one [one who helps the foreigners]. Kill them all!" … There was no stopping the Boxers now. About ten of them swarmed onto the boat. Halvor commanded Hannah to hide the children. Himle took them below. Halvor grabbed an oar from the deck and began to swing wildly. Carl found a rope. Both men fought as never before, calling loudly for the Lord's cooperation as they struck out savagely at anyone within their reach. Below the deck, Hannah and Alice were terrified. Unable to find a place to hide, Hannah squatted on the floor trying to hider Almah [her daughter] under her skirt. "Oh, God, save us now!" Himle grabbed a sword from the wall and joined the battle on deck. Hannah could stand it no longer. She took a wooden stool as a weapon and ran out. "Guard the kids!" she called to Alice. Terrified by the brawl on deck, she jumped on the cabin roof. Halvor and Carl were standing back to back against the mainmast holding their own against the Boxers, with Halvor swinging his oar and lashing out with his foot, Carling whipping his rope like a Western cowboy, and the good Dr. Himle thrusting his sword like a scalpel. A Boxer looked up and saw Hannah atop the cabin. "Ai ya! More foreign devils!" She smashed him on the head with the stool. He rolled back on the deck. At this point, Hannah mistakenly thinks the captain and his crew are about to turn on Halvor and attack him with spears, but, after she smashes another Boxer with the stool and looks again, she realizes they are coming to help him. "Oh, thank G--," but her prayer was interrupted by a fresh volley of stones being hurled from the shore. Halvor was hit full in the chest and fell to the deck on his back, feet up. Two Boxers leapt on him. By this time, Chester and Nelius [young sons of Halvor and Hannah] were on deck, eager to join the fighting. Years later Chester recounted the events: "One fellow landed, stomach down, on the soles of Papa's two feet and found himself suspended in air. Papa launched a quick kick and catapulted the surprised Boxer up and over the railing into the river on the deep side. You know, very few Chinese can swim. He let out such a scream of horror that the other froze in their tracks. Papa jumped up and with a save yell dived off the rail into the water after the Boxer. We thought he was going to drown him." As I read of the man in the river screaming in terror, I thought, "Ah, there's the key! Knock them all into the water. Do it now while they pause to look over the edge of the boat!" God bless him, that wonderful saint, Halvor Ronning, had a different idea that shows me who he really was. He was not a Viking seeking to destroy his enemies, but a man of God who loved even those who wanted to ill him. Instead of pushing more Chinese men into the river as the turned to watch, he dove into the dark river and went below, seeking for the dying man who moments earlier had tried to kill him. Now the battle was forgotten. Boxers, rabble, sailors, and missionaries almost tipped the junk by running to the side of the deck to look. There was no visible trace of either the missionary or the Boxer — only a flurry of ominous bubbles. Carl was about to dive in after Halvor when two heads appeared. Halvor, swimming on his back, had his left arm clenched around the Boxer's neck. He towed him ashore. The Boxer looked dead. Everyone, including Chester and Nelius, ran down the gangplank. Dr. Himle laid the Boxer face up and applied artificial respiration. There was total silence. Minutes seemed like hours. The Boxers crowded closer, encircling the missionaries. "They are surely killing him. They really are devils. This proves it." "What are we waiting for? We have them now! Let's kill them!" Although some joined in heaping scurrilous abuse on the missionaries, no one lifted a hand against them. Instead they waited, watching the doctor suspiciously. The suspense seemed endless. The missionaries knew that if Himle failed to resuscitate the man, they would all be killed. Perspiration rolled down the doctor's face as his hands attempted to press and pull. The mood of the crowd was dangerous. "Keep calm" whispered Halvor as he put his arms around Hannah and the children. The mob was losing patience. With evil looks, sinister innuendoes, and threatening gestures, the Boxers left no doubt as to what there were intending to do. They began to discuss how they should put the missionaries to death. "Build a fire," cried one. "Roast them!" "No, no," shouted another, "They should be beheaded like common criminals." "What are they talking about, Papa?" asked Chester in alarm. "Be calm, my son. God is with us." Suddenly the Boxer moaned. "He lives!" cried Himle. This was the second time he had brought a Chinese patient back to life. Tears and sweat rolled down his face. The missionaries gave thanks to Jesus Christ, but the Boxers quickly took credit. "He lives! Now you see," cried the head Boxer. "We are invulnerable. We can live forever. This proves it!" For Halvor and the missionaries, this was obviously a miracle from God, and they gave thanks. Reminding us why miracles on their own do little to convert, the Boxers claimed this miracle was proof of their invulnerability, not recognizing the source of the miracle they had witnessed. With the distraction created by the revival, the captain, crew, and passengers were able to get back on board and cast off, their lives spared. What a remarkable man Halvor Ronning was. What a remarkable woman Hannah was. I'll share more about her later. China was in their blood and they would come back again, ready to sacrifice everything once more to bless the lives of many. Having just finished this book, I feel that Halvor and Hannah Ronning are family members. How I admire them and look forward to meeting them someday. God bless them for their service to China. May we learn from their love and willingness to serve. They understood that every soul matters, that every human being is a son and daughter of God, not a statistic. "Halvor Ronning" in The Biographical Dictionary of Chinese Christianity, bdcconline.net. "Chester Ronning" (son of Halvor who became Canada's ambassador to China), Wikipedia.com. "China Mission: The Chester Ronning Story," a 1980 film by Tom Radford for the National Film Board of Canada (www.nfb.ca). You will learn much about the lives of Chester's parents in Part One of this well-made documentary, though there are some distressing photographs not suitable for children.